An calligraphy exhibition was held at Gaiety theatre today. Governor Acharya Devvrat was the Chief Guest on the occasion.While addressing as in function the Governor said that the first impression of any student at school level reflects from his handwriting skills. In earlier times, more attention was paid to impressive and beautiful writing in schools, but with the passage of time has disappeared, which needs to be encouraged,he added.He stressed on organizing programmes for promoting on handwriting skills at school level and said that the education department should take initiatives to organize competitions in this direction which would be helpful in developing creativity among students. 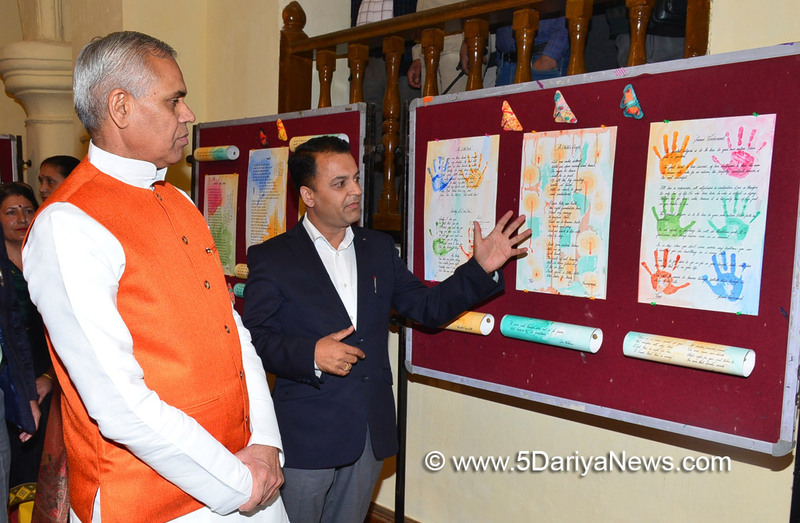 He also urged the teaching community to organize training classes for good handwriting.Earlier, the Governor also inaugurated the calligraphy exhibition put up by Shri Virender Kumar, teacher from High School, Mandri in district Shimla. He appreciated the work of Shri Virender Kumar and his initiative in organizing such programmes.